Buy #1 Live Kratom Plants - Guaranteed to Arrive Healthy 4 - 6"
Have you ever wanted to grow your own kratom plants? Are you concerned that one day the government’s actions may endanger the supply of kratom? Look no further, we have live Rifat and Malay strain kratom plants available! This has been a long time coming and we are proud to be one of the few vendors actually offering live kratom plants. These plants come in two sizes: rooted cutting, which will be about 2″ when potted, and a 4 – 6″ plant. Both sizes come with soil and a small pot, so all you have to do is put them in the pot and add water! 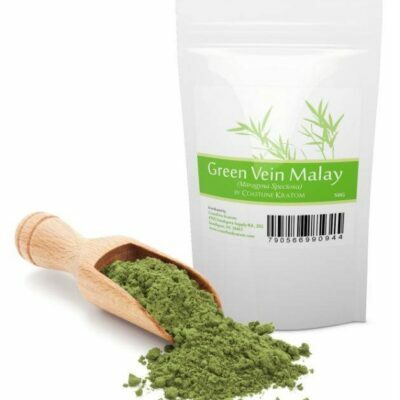 Malay comes from Malaysia, and Rifat, named for kratom pioneer Claude Rifat, comes from Thailand; Rifat is known for its high mitragynine content. These plants do not come with different colored veins, such as red, white or green. The color of the vein is actually determined by the spectrum of light the plant is exposed to. Red light will make red vein; blue light will make green vein; and white light makes white vein. You can even put one of each light on each side, and get both colors on the same tree! Each plant comes with its own special soil mix, humidity chamber, and growing instructions. Though they start out small, kratom plants can grow 15 – 20 ft. tall and once mature produce leafs quite rapidly. These plants are a long-term investment and in fact may take a year or possibly even two before they become mature enough to harvest. Once harvested, you will have your own leafs available for grinding, tea, or whatever else you may like to use them for. Kratom plants have a reputation for being a difficult plant to cultivate. Experience growing plants will be helpful, but even with no experience, careful attention will allow these plants to thrive. Due to the fact that we cannot confirm how kratom plants are cared for after they arrive, we do not offer a refund on these plants other than immediately after they arrive, in case there is damage to the plant. If there is damage, the plant must be mailed back in a box priority at the customer’s expense before a refund is issued. Although we often ship within a few days, due to high demand, please allow up to two weeks for shipping. This product ships separately from our other products, so it will not delay your order. Transfer kratom plants into the container with soil provided. Keep inside the humidity chamber provided for 2 days. After that point, remove the plant from the chamber. Humus-rich soil is recommended. Provide liberal sunlight, water, and nutrients. The kratom plant wants to grow into a 15 – 20 ft. plant, so it is a heavy feeder. Exposure to wind also is known to increase the mitragynine content of the leafs. Kratom plants should not be exposed to temperatures below 40 degrees.